Sanctioned for six months, DWP incompetence , vulnerable person owing £1000 rent. Universal credit hell. Members of the Tory party of course denied that the film is actually a reality for many, indeed the reality is often much worse. Sadly no one was prompted by the film to come and join us today, and although I understand why many can’t for various reasons, you’d have thought that it might have prompted someone. Many thanks to everyone reading my blog for your support and also for working hard online to get the word out. This is also very important. Because of all the publicity surrounding Brexit at the moment issues such as universal credit etc have been forgotten. Please remember that people are still suffering, even more so than they were before. Universal credit is still being rolled out in areas that didn’t already have it, such as nearby Stockport. My sympathies lie with everyone forced onto this inhumane system. The first person that I spoke to today was a younger man that’s claiming ESA and PIP at the moment. He’s struggling because his payments have been reduced so he no longer receives the care that he needs. I advised him and signposted him also. He took a food parcel, but I’ve got no idea how he’s supposed to survive this awful system. It was then that I spotted a young man leaving the Jobcentre looking annoyed to say the least. I walked over and asked him if I could help with anything, he then told me what had happened to him. I’ll call him Dave. Dave has been sanctioned for six months. Dave doesn’t understand how the system works. Dave was already claiming universal credit but hadn’t been told about having to change over to the new computer system. Dave didn’t know his new 15 digit pin to get access to his account because he wasn’t given it. Dave was sanctioned for six months because he couldn’t log into his account. No one explained this to Dave. Dave has appealed this sanction, and is now hopeful of the sanction being lifted and his money reinstated. Dave will never receive an apology from the DWP because the DWP will never acknowledge their incompetence and will always pass the blame to the claimant. One day we will make the DWP pay for the suffering that they’ve inflicted upon thousands of people. I spoke to a woman claiming ESA, she wasn’t aware of the so called ‘blip’ regarding ESA recently, she doesn’t have access to the internet and nor would she use it because she says that she doesn’t understand how to use it. I advised her and had a good chat with her. The DWP can be really petty at times, their pettiness doesn’t exclude the children of claimants. Two children weren’t allowed to enter the Jobcentre with their parents because they had a drink. Yes a drink. They weren’t being silly, they were well behaved and polite, and this isn’t a new issue either. No drinks, no food, no mobile phones and claimants aren’t encouraged to talk to each other. Its a culture of fear. But hey, DWP staff can have a cuppa whilst they’re sat at their desks. Double standards once again. 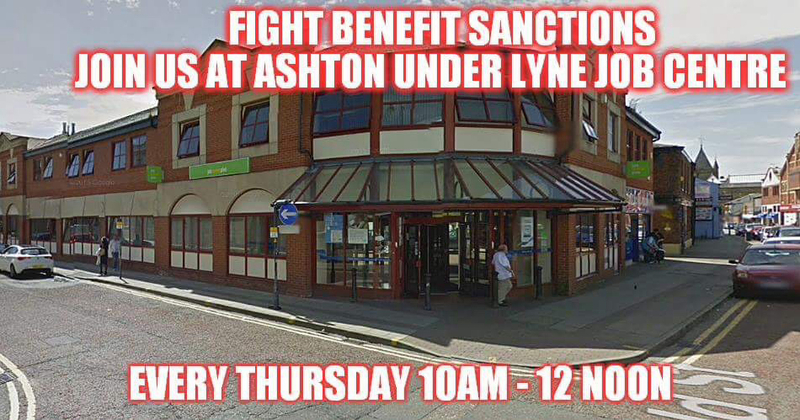 Lets also not forget that many Jobcentres won’t allow claimants to use a toilet or their lifts either. We spoke to a homeless man that told us that he was from Palestine. We weren’t sure of his exact circumstances but we do know that he told us that he’d been out of this country for three months so wasn’t able to claim anything from the DWP. We signposted him etc, but we’re limited to what we can do on the street. I hope that he’s found somewhere to stay. We then stopped to talk to a homeless man. He’s living in a tent with his partner and hostels don’t always allow couples to share a room. They are accessing services at a local Emaus and are doing their best to survive. They’ve been there a while and feel more secure than in a hostel. They also don’t want to be dependent upon a hostel because a large amount of their monies will be taken by a hostel for their rent etc. He’s an intelligent man, has worked for over 30 years and unexpectedly fell upon hard times. Now this is where the incompetence of the DWP comes into play. His partner is in hospital, on a concoction of drugs to keep her pain free. Because they have a joint universal credit claim, he was told that he cant hand in his partners sicknotes and state why she’s ill. Nope. Madness. Instead the advisor that he spoke to told him that only his partner could log in and report this. He looked everywhere for her password but couldn’t find it so he told his advisor. His advisor more or less said that it was tough, and nothing could be done about it. Today, after talking to us, he went in again and spoke to a different advisor who told him that it was ok, log it online on their joint account and post the fit note off. So once again due to the DWPs incompetence an already vulnerable couple were put through what I call hell. Don’t ask me to have any sympathy with the DWP, thanks to the advisor that spoke to him though and helped him. I spoke to an older disabled man who was claiming ESA. 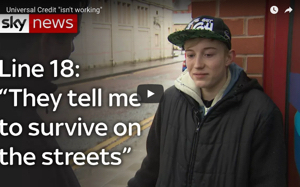 He’s £1000 in debt with his rent, has no money to buy food etc. He was wrongly told a while ago that he had to stop claiming ESA and to move over to universal credit, remember I wrote about this a while ago.. Please see my previous blogs. Needless to say I was furious, I honestly thought that this had been sorted out etc, but this man, like many others hasn’t spoken to anyone about his problems. He’s proud, confused and also scared of the system. We did the decent thing, helped him, advised him and signposted him. Just think, how many extremely vulnerable people are forced into this situation, its scary, being all alone not knowing what to do. Always double check any advice that you get from the DWP because they can’t be trusted to give out correct guidance. Once again the DWPs incompetence raises its ugly head. I spoke to a woman outside the Jobcentre. She’s married, her husband works. Three weeks ago she’d been advised to claim universal credit. She did just that, and her application was rejected. Luckily she had another appointment today with a different advisor who told her that she could still apply for Jobseeker’s Allowance until she’s shifted over to universal credit. When she gets moved onto universal credit she won’t be able to claim anything because of the hours that her husband works. This goes to show that universal credit does make you worse off. She also was led down the wrong path by the DWP and wasted three weeks. Three weeks without any hope. Its atrocious. I also heard a rumour that Avon have been seen inside Glossop Jobcentre. Not surprising because they’ve been inside Ashton Jobcenre in the past. Ive already posted about their visit to Ashton, as well as the army’s recruitment visits. Not only is it extremely hard for anyone to actually get a proper wage, or even any payment from selling Avon, more and more people are buying their make up at cheaper outlets and online. Avon needs to stop praying on the vulnerable to seek their wares. It’s not on, it gives people false hope. Just stop it. Today was busy, and as universal credit is continuing to be rolled out its going to become much worse. People will need more help than ever before, but there’s a distinct lack of help out there. The services already available are full to bursting already. Be a friend to someone, read up on universal credit so that you’ll be able to offer advice, even if its only a bit of advice it matters. Check on your neighbours, be kind because believe me its going to get much worse. Please support myself, DPAC and other campaigners in campaigning to stop and scrap universal credit. It needs to be replaced with a system that cares, that understands that everyone is an individual with differing needs. Lets vote this government out in the event of a general election. We deserve much more than this, we deserve respect and to be able to live without the fear of the DWP hanging over us. I’m not sure that we can take much more of this. Today we handed out all of our food parcels within minutes, helped lots of people and gave people hope. Please read, share, email, tweet my blog. Thanks to everyone who already do this. Massive thanks to everyone that supports my blog also. There’s a donation button at the top and side of this blog. Thank you!